In an interview with SP's Land Forces Team, Lt General D.S. Siddhu, Director General, Mechanised Forces, Indian Army, who has wide experience in commanding armoured units and formations in all types of terrain in our border areas, spoke about the roles and modernisation status of the mechanised forces which comprise both armour and mechanised infantry. SP's Land Forces (SP's): What is the role of your Directorate with regard to the designing of future tanks and ICVs for the Armoured Corps and Mechanised Infantry? Director General Mechanised Forces (DGMF): The DGMF is the nodal agency for propagating the General Services Qualitative Requirement (GSQR) for designing tanks and ICVs. We endeavour to tailor the mechanised force and the equipment to remain current with the ever changing futuristic battlefield scenario and achieve the desired operational capabilities. Prior to finalising the design, wide consultations and discussions are held with all the stakeholders, i.e. intra-service, and with the designers, producers and the quality assurance agencies. In addition, efforts are made to be current with the latest technologies available globally by organising international seminars and presentations by relevant vendors. This is then discussed with the Defence Research and Development Organisation (DRDO) and other agencies and finds expression as a Preliminary Staff Qualitative Requirement (PSQR). After further deliberations, this gets converted to a General Staff Qualitative Requirement (GSQR) prior to development of the prototype. Conceptualising and monitoring of the new tank/ICV in all stages of its development, right from the PSQR stage to its regular production, is done by the Mechanised Forces Directorate. SP's: In the context of the changed nature/character of war, have any new roles been defined for the Mechanised Forces? DGMF: To remain operationally relevant in the changing scenario, there is a need to constantly develop, evolve and adapt to the changing threat spectrum. With this as the focus, Mechanised Forces are developing capabilities to fight and decisively influence outcome of operations across the entire spectrum of conflict. In addition to our traditional role in conventional operations, we are concentrating on widening our employability to include operating in high altitude areas (HAA), counter-insurgency, counter-terrorism, out of area contingency situations and the United Nations (UN) mandated operations. SP's: Has any thought been given to the indigenous development of the future main battle tank (FMBT)? Who are the stakeholders involved and what would be their role? Has the PSQR been finalised? DGMF: The FMBT will be an indigenous tank. The development model would be based on the guidelines of the Defence Procurement Procedure (DPP) and indigenous industry would be involved to the extent possible. All stakeholders would be brought on board as the project progresses. SP's: Has a final view emerged on the requirement of a light tank for the Eastern Theatre as also for some sectors of our mountainous regions? What is the current status in this regard? DGMF: The operational requirement of light tanks exists in our country in the Eastern Theatre, certain high-altitude areas as well as for amphibious operations. Can one armoured vehicle perform both roles is the challenge. However, for it to be viable, there need to be adequate numbers. This is being currently debated. SP's: It seems that the T-90 will be our MBT for the next decade or so. Have any major modifications been planned in view of the changing battlefield environment? How are we catering for the digitisation of the battlefield in the future? DGMF: As the mainstay of the armoured fleet, the T-90 Tank is slated to receive state-of-the-art upgrades to maintain its dominance on any future battlefield. These modernisation schemes include an active protection system, improved Commander's thermal imaging sights providing true 'hunter-killer' capability, an advanced muzzle reference system for retention of zeroing both by day and night and necessary software upgrades to optimise the capabilities of the fire control system. In addition to a modernised digital fire detection and suppression system, the tank will also be fitted with an environmental control system to ensure longevity of sensitive opto-electronic sub-systems. A project for fitment of an auxiliary power unit to enhance 'silent watch' capability and conserve engine life is also under way. As regards digitisation of the future battlefield, we plan to fit the digital control harness. In addition, the Army is considering introduction of a software defined radio (SDR) which will ensure real time data, voice and image transfer. The SDR hierarchy will also support the battlefield management system (BMS) being developed indigenously. SP's: Have we identified the light armoured vehicles for the reconnaissance troops and platoons in armour and mechanised units? What type of LAVs are we looking at? DGMF: The light armoured multipurpose (LAM) vehicles for the reconnaissance elements of the mechanised forces should be agile, adequately protected and have adequate firepower. Major requirements specified for the LAM vehicle are that it should have a maximum weight of eight tonnes, with a minimum payload of 1.5 tonnes. The LAM is a 'Buy and Make (Indian)' project. The request for information (RFI) for the LAM has been issued and responses received. A project Appraisal Committee has been appointed by the MoD which is in the process of finalising the list of vendors to whom the request for proposal (RFP) will be issued. SP's: What is the status of the T-72 upgrade and modernisation programme? What is the focus currently and where have we reached? DGMF: Tank T-72 comprises the majority of our tank fleet today. These are of 1972 vintage and need to be modernised to enhance their mission reliability. With this in view, we are in the process of replacing the existing engine with a more powerful engine, incorporating an auxiliary power unit, fitting a thermal imaging fire control system for the gunner with suitable night enablement for the driver and commander also. Other upgrades include the digital control harness and modernisation of the fire suppression system. To provide necessary realism to training; simulators for drivers, gunners and an integrated crew simulator for the crew are in various stages of introduction. SP's: Survival of the tank on the future battlefield will depend on upgraded armour to withstand various types of attacks anticipated; function as an All Arms Team to cater to different types of weapon systems including aerial attacks; for up-to-date situational awareness at all times. What is being done to meet these requirements of the future battlefield? DGMF: We are planning to enhance protection in terms of improved passive armour, reactive armour and incorporation of an active protection system (APS) in our tank fleet. In addition, protection measures for tanks/ICVs while fighting in built up areas is also being developed in the form of tank urban survival kit and BMP urban survival kit. The concept of functioning as an All Arms Team is the cornerstone of mechanised operations. Adequate emphasis in the form of training, having the correct mix of weaponry and integrated operations is being given. Situational awareness systems along with the battlefield management are being developed indigenously. However, the last two are areas where we need to make faster progress. 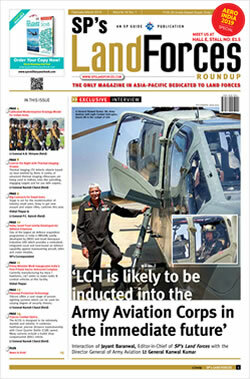 For complete version of the interview, read upcoming issue of SP's Land Forces (Issue IV- August-September), 2012.